You must be signed in as an administrator to enable or disable showing the battery life estimated time remaining. I tried getting the estimated battery time loaded several times and cannot get it to take. Seems like the registry entry made it ok and the ones that were to be taken out are gone. Did the reboots and all, just no go. I've noticed that it sometimes take a moment to first show the time remaining after a restart. Just to note, the time remaining will never show while plugged in. It'll only show while running on battery power. Thanks Brink. 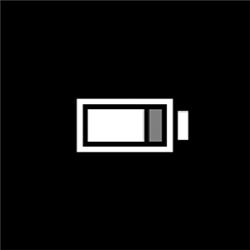 Been on battery most of the time and no show yet. Will keep an eye on it though and post back if and when it works. Did some research because not getting this to work bugged me and I ended up on an HP Spectre forum. Somewhere around 2015 HP decided the battery time remaining was not accurate enough for people to use and had it Disabled in the BIOS and that's how it remains. The post showed the obvious easy fix in the BIOS back to "Enabled" and my time remaining works perfectly now. About "HP decided the battery time remaining was not accurate enough for people to use"
The battery time remaining reading is an instantaneous prediction, with a cumulative aspect to it, and it jumps about quite a bit as your computer does different things. So any current reading can be useful or useless. That might explain HP's action. Perhaps they added in an HP utility to do the job better???? I understand what you are saying. Just thought that this would be a useful tool when unplugged. What HP left was the battery percentage which is very useful to me. I'll just monitor the time remaining and see how well it does and take in account what is being run at the time. Thx. Great news. Thank you for posting back with your solution.